need help on installing hid's !!!!! Thanks guys for the detail information. I am about to start with this project as well. your the man thanks for all your help !! thanks to you to rom !!! For our HID Install, RayGS3 and I both used the female connectors below (bought from Radio Shack) and attached them to the OEM HID connector also pictured below. I cut off the stock 9006 connector and attached the female connector. There is a little piece of plastic inbetween the positive and negative prongs on the OEM HID connector to keep them from touching. Then we wrapped the connection up with electrical tape. I am still using the 15 amp fuse that was used for my halogens and have not had any problems. Please keep a fire extinguiser in your car. Thanks. i hope mine arent this hard!! What are you trying to do with yours? i have some oem hids comming but will mine be just as hard to connect cuz i will be insalling myself? mikal ...man i cant thank you enough iam referring to this thread again cause i have a bad ignitor in my stock ballast and i have to get some more of those connectors ad resolder them to the new ballast so thanks !! ANYBODY OUT THERE I NEED A OEM BALLAST PLEASE PM ME IF YOU HAVE 1 i got pulled over tonight cause of the headlight out !! hmm why do you have to run another whole harness from xenondepot? 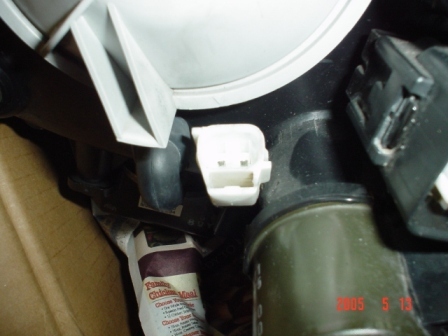 can't you just get a jumper harness from a halogen 9006 plug to a hid d2r plug? i just bought some oem hid headlights and its on its way and that is what i was planning on doing? i was wondering if someone can help me find a part number. i need the plug that plugs into this HID ballast plug. it is the female plug that i need. with a couple inches of wire on the end. reason is because i am trying to make a jumper or conversion harness from a 9006 plug to a oem hid ballast plug. You're better off converting the plug on the ballast to 9006. Quick Reply: need help on installing hid's !!!! !